Background: Recent lipid guidelines recommend aggressive low-density lipoprotein (LDL) cholesterol lowering in patients with coronary artery disease. To clarify the evidence for this recommendation, we conducted a meta-analysis of randomized controlled trials that compared different intensities of statin therapy. Methods: We searched electronic databases (MEDLINE, EMBASE, Cochrane Central Registery of Controlled Trials, Web of Science) for randomized controlled trials published up to July 19, 2007, that compared statin regimens of different intensities in adults with coronary artery disease and that reported cardiovascular events or mortality. Data were pooled using random-effects models to calculate odds ratios (OR). Results: A total of 7 trials (29 395 patients) were included. Compared with less intensive statin regimens, more intensive regimens further reduced LDL levels (0.72 mmol/L reduction, 95% confidence interval [CI] 0.60–0.84 mmol/L), and reduced the risk of myocardial infarction (OR 0.83, 95% CI 0.77–0.91) and stroke (OR 0.82, 95% CI 0.71–0.95). Although there was no effect on mortality among patients with chronic coronary artery disease (OR 0.96, 95% CI 0.80–1.14), all-cause mortality was reduced among patients with acute coronary syndromes treated with more intensive statin regimens (OR 0.75, 95% CI 0.61–0.93). Compared with lower intensity regimens, more intensive regimens were associated with small absolute increases in rates of drug discontinuation (2.5%), elevated levels of aminotransferases (1%) and myopathy (0.5%), and there was no difference in noncardiovascular mortality. All 7 trials reported events by randomization arm rather than by LDL level achieved. About half of the patients treated with more intensive statin therapy did not achieve an LDL level of less than 2.0 mmol/L, and none of the trials tested combination therapies. Interpretation: Our analysis supports the use of more intensive statin regimens in patients with established coronary artery disease. There is insufficient evidence to advocate treating to particular LDL targets, using combination lipid-lowering therapy to achieve these targets or for using more intensive regimens in patients without established coronary artery disease. We performed a systematic review and meta-analysis to critically examine the evidence for the safety, efficacy (LDL lowering) and clinical effectiveness from trials comparing more intensive statin therapy with less intensive statin therapy in patients with coronary artery disease. A librarian searched MEDLINE (from 1966), EMBASE (from 1988) and the Cochrane Central Registery of Controlled Trials using relevant subject headings, chemical abstract registry names and text–word searching for statins or hydroxymethylglutaryl-CoA reductase inhibitors (for search terms, see online Appendix 1 available at www.cmaj.ca/cgi/content/full/178/5/576/DC2). The search was conducted on August 10, 2006, and it was updated July 19, 2007. We also conducted a “cited-reference search” in Web of Science for all eligible papers, reviewed the reference lists of all included studies and review articles, and contacted content experts. K.J. and F.A.M. independently screened all citations, abstracted data and assessed methodologic quality. Disagreements were resolved by consensus. All of the included trials reported composite primary outcomes, but because these differed among studies, they were not appropriate for meta-analysis. Instead, we extracted the individual outcomes from each study that were objectively defined and common among studies (e.g., death, myocardial infarction, stroke). Figure 1: Flow of trials through the selection process. Table 1 presents key characteristics from the 7 trials (reporting data from 29 395 patients with coronary artery disease) included in our review.15–21 Of these trials, 2 enrolled patients after acute coronary syndromes and 5 enrolled patients with chronic coronary artery disease. The demographic characteristics of study participants were similar across the included trials. Baseline LDL cholesterol ranged between 2.74 mmol/L in the PROVE IT–TIMI 22 (Pravastatin or Atorvastatin Evaluation and Infection Therapy–Thrombolysis in Myocardial Infarction 22) trial to 3.9 mmol/L in the REVERSAL (Reversal of Atherosclerosis with Aggressive Lipid-Lowering Therapy) trial, TNT (Treating to New Targets) trial (before the run-in period, 2.6 mmol/L before randomization) and the Vascular Basis trial. Three trials were designed with continuous outcomes as their primary outcome: the Vascular Basis and the SAGE (Study Assessing Goals in the Elderly) trials reported the number of ischemic episodes20,21 and the REVERSAL trial reported percent change in atheroma volume.19 Four trials used clinical primary composite outcomes, but the individual components differed (Table 1).15–18 Of note, the definitions for several of the composite cardiovascular outcomes were different in the primary publications from the PROVE-IT and the A-to-Z (Aggrastat to Zocor) trials than those used in the other trials; however, these outcomes were re-reported by the PROVE-IT and A-to-Z investigators (using the definitions from the other trials) in a secondary publication.24 We extracted data on “myocardial infarction or coronary death” and “stroke” for PROVE-IT and A-to-Z from this follow-up publication.24 All other outcomes were extracted from the primary study publication. Potential threats to study generalizability are reported in Table 2. For example, although the IDEAL (Incremental Decrease in End Points Through Aggressive Lipid Lowering) trial randomized over 90% of patients screened, TNT excluded almost half of those initially screened. Further, although both TNT and IDEAL included patients with stable coronary artery disease, they recruited patients from specialty clinics rather than from primary care settings. In addition, the percentage of patients using statins before randomization varied widely among the trials. The A-to-Z trial excluded all patients who had previously received statin therapy. The TNT trial included a run-in phase such that 100% of patients had received statin therapy for at least 8 weeks before randomization. Compared with the lower intensity arm, the higher intensity arm in each trial achieved lower LDL cholesterol levels. The differences in LDL cholesterol levels were between 0.39 and 1.0 mmol/L (weighted mean difference 0.72, 95% CI 0.60–0.84 mmol/L). An LDL cholesterol of less than 2.0 mmol/L was achieved in about 50% of patients in the more intensive statin monotherapy groups (Table 1). The pooled analysis revealed no difference in all-cause mortality between the more or less intensive statin treatment arms in all 7 trials (OR 0.87, 95% CI 0.74–1.03). However, there was substantial heterogeneity among trials (I2 = 42%), and pooling the data obscured the fact that more intensive statin therapy was associated with a 25% reduction in mortality in patients after acute coronary syndrome (based on 353 events in 8659 patients, OR 0.75, 95% CI 0.61–0.93), but had no impact on mortality in patients with chronic coronary artery disease (based on 1333 events in 20 734 patients, OR 0.96, 95% CI 0.80–1.14). More intensive statin therapy led to a statistically significant reduction in myocardial infarction or coronary death (OR 0.83, 95% CI 0.77–0.91) with no heterogeneity among trials (I2 = 0%) (Figure 2). Examining each of these components separately confirmed that the benefits were seen in patients after acute coronary syndromes or with chronic coronary artery disease and for both nonfatal myocardial infarction (based on 1772 events in 28 439 patients, OR 0.85, 95% CI 0.77–0.93) and coronary deaths (based on 839 events in 28 439 patients, OR 0.84, 95% CI 0.71–0.98). Figure 2: Risk of myocardial infarction or coronary death among patients with acute coronary syndromes or chronic coronary artery disease in 7 studies of statin therapy intensity. Although TNT was the only trial to demonstrate a significant benefit in stroke reduction, the pooled results demonstrate a statistically significant reduction in the number of strokes with more intensive statin therapy compared with less intensive therapy (OR 0.82, 95% CI 0.71–0.95) with no heterogeneity among trials (I2 = 0%) (Figure 3). The results were similar among patients with chronic coronary artery disease or with acute coronary syndromes (p = 0.21 for comparison between each OR). Figure 3: Risk of stroke among patients with acute coronary syndromes or chronic coronary artery disease in 7 studies of statin therapy intensity. Only the IDEAL, TNT, SAGE and Vascular Basis trials reported rates of major cardiovascular events (myocardial infarction, coronary death or stroke). The pooled analysis confirmed fewer major cardiovascular events in the more intensive statin treatment arm of these trials (OR 0.80, 95% CI 0.71–0.90, I2 = 27%). Five trials15–18,21 reported noncardiovascular mortality. There was no difference between more intensive and less intensive statin regimens in these trials (based on 670 noncardiovascular deaths in 28 439 patients, OR 0.93, 95% CI 0.69–1.25). Myopathic adverse events were inconsistently reported and were not significantly more frequent among patients receiving more intensive statin therapy compared with less intensive therapy (Table 3, Table 4). Although the event rates were low, all of these trials used statin monotherapy, not the combination therapy that is frequently recommended to achieve target LDL levels less than 2.0 mmol/L. 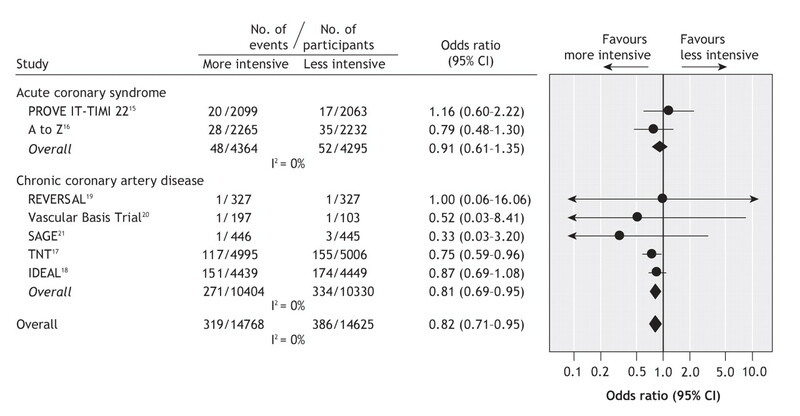 None of the quality variables included in Table 2 influenced the study outcomes. For example, for the most frequent outcomes (myocardial infarction or coronary death), there was no difference in effect estimates for those trials with adequate allocation concealment (OR 0.85, 95% CI 0.77–0.97) compared to those without adequate allocation concealment (OR 0.80, 95% CI 0.71–0.91). There were also no differences in the trials with run-in periods (OR 0.78, 95% CI 0.67–0.91) and those without run-in periods(OR 0.86, 95% CI 0.78–0.95). Our systematic review demonstrates that, among patients with coronary artery disease, the provision of more intensive statin monotherapy (compared with less intensive statin therapy) reduces LDL cholesterol levels by a further 0.72 mmol/L. This additional reduction in LDL cholesterol resulted in 17% fewer myocardial infarctions (absolute reduction 1.4%) and 18% fewer strokes (absolute reduction 0.5%) among patients randomized to more intensive statin regimens rather than less intensive regimens. These benefits of more intensive statin monotherapy were at the expense of small absolute increases in the frequency of drug discontinuation (about 2.5%), elevated aminotrasferase levels (about 1%) and myopathy (about 0.5%) when compared with less-intensive statin therapy (only the aminotransferase elevations were statistically significant). There was no difference in noncardiovascular mortality. All-cause mortality was not reduced among patients with chronic coronary artery disease, but it was reduced by one-quarter among patients treated after acute coronary syndromes (absolute reduction 1.1%, number needed to treat 91). Second, it is important to highlight that these trials provide evidence for more intensive statin monotherapy. None of these trials used, or even permitted, combination therapy. Achieving lower LDL cholesterol targets will often require the use of multidrug therapy, which may result in increased risk of adverse effects, drug–drug interactions and medication nonadherence as well as increased costs for both patients and health care payors.10,26 It is not enough that short-term trials with LDL cholesterol outcomes have demonstrated that other lipid-lowering agents can further lower LDL cholesterol when given along with statins.27–29 Large trials are needed to establish the clinical safety and effectiveness of combination therapy. Fourth, although the INTERHEART study and cohort studies from various regions of the world have confirmed that dyslipidemia is the most important modifiable coronary risk factor worldwide,1–4 the trials showing the efficacy of statin therapy have largely enrolled white men. For example, in our meta-analysis 88%–97% of study participants in the 4 trials that reported participant ethnic background were white and 69%–81% were men.15,17,19,21 Although it is unsettling to discover evidence grey-zones for important demographic groups, and such findings should always stimulate research to address these evidence gaps, it is important not to deny treatment to patients in these under-researched groups. For example, although individual trials were unable to confirm the benefits of statin therapy in women, a meta-analysis that pooled individual patient data from 14 trials had sufficient outcomes to confirm that statins prevented coronary events in women (OR 0.82, 95% CI 0.73–0.93).5 Given that “most individuals with a particular condition benefit from therapies proven to be efficacious and relative treatment effects tend to be consistent across differing baseline risks,”31 it seems reasonable to assume that groups at higher coronary risk (such as South Asians) are likely to derive the greatest absolute benefits from more intensive rather than less intensive statin therapy. Finally, although more intensive statin therapy was well tolerated and relatively safe in the trials we reviewed, it is likely that adverse events will be more common in clinical practice for several reasons. First, trial participants are generally younger and healthier and they are more closely followed than patients in usual clinical practice. In addition, these trials excluded over half of all screened patients because of comorbidities (e.g., advanced age, renal failure, alcohol abuse, hepatic failure) or use of concomitant medications (e.g., other lipid-lowering drugs, inhibitors of the cytochrome P450 system), which may increase the risk of adverse events.32 Second, 2 of these trials only enrolled patients after they had successfully completed a run-in period without complication.33 Third, the time frame of these randomized trials is relatively short and underscores the importance of postmarketing surveillance studies to track complication rates and drug-discontinuation rates in usual clinical practice. The ongoing SEARCH (Study of the Effectiveness of Additional Reductions in Cholesterol and Homocysteine) trial will provide much needed safety information on more intensive statin therapy (simvastatin, 80 mg/d v. 20 mg/d) over a longer timeframe (12 064 study participants, expected average follow-up of 7 years). In summary, more intensive statin therapy is safe and well-tolerated. It provides incremental benefits over and above those of lower-intensity statin therapy in the secondary prevention of myocardial infarction and stroke in patients with known coronary artery disease, irrespective of their baseline LDL cholesterol levels. Further research is needed to define optimal LDL cholesterol targets, the role of more intensive statin therapy in patients without coronary artery disease and the role of combination therapy. Contributors: All of the authors contributed to the study conception and design. Kiranbir Josan and Finlay McAlister were resposible for data acquisition and analysis. All of the authors contributed to the interpretation of the data, drafted and revised the manuscript critically, and approved the version to be published. Acknowledgements: We thank Jeanette Buckingham MLIS for assistance with the literature search. Finlay McAlister and Sumit Majumdar receive career salary support from the Alberta Heritage Foundation for Medical Research and the Canadian Institutes of Health Research. Finlay McAlister is also supported by the Merck Frosst/Aventis Chair in Patient Health Management at the University of Alberta. There was no project-specific funding for this study. Competing interests: None declared for Kiranbir Josan and Sumit Majumdar. Finlay McAlister has received funding from Pfizer Canada for an investigator-initiated and investigator-designed trial that was peer reviewed and co-founded by the Heart and Stroke Foundation of Canada. Yusuf S, Hawken S, Ounpuu S, et al. Effect of potentially modifiable risk factors associated with myocardial infarction in 52 countries (the INTERHEART study): case-control study. Lancet 2004;364:937-952. Verschuren WMM, Jacobs DR, Bloemberg BP, et al. Serum total cholesterol and long-term coronary heart disease mortality in different cultures. Twenty-five year follow-up of the seven countries study. JAMA 1995;274:131-6. Chen Z, Peto R, Collins R, et al. Serum cholesterol concentration and coronary heart disease in population with low cholesterol concentrations. BMJ 1991;303:276-82. O'Keefe JH, Cordain L, Harris WH, et al. Optimal low-density lipoprotein is 50 to 70 mg/dl. Lower is better and physiologically normal. J Am Coll Cardiol 2004;43:2142-6. Cholesterol Treatment Trialists' Collaborators. 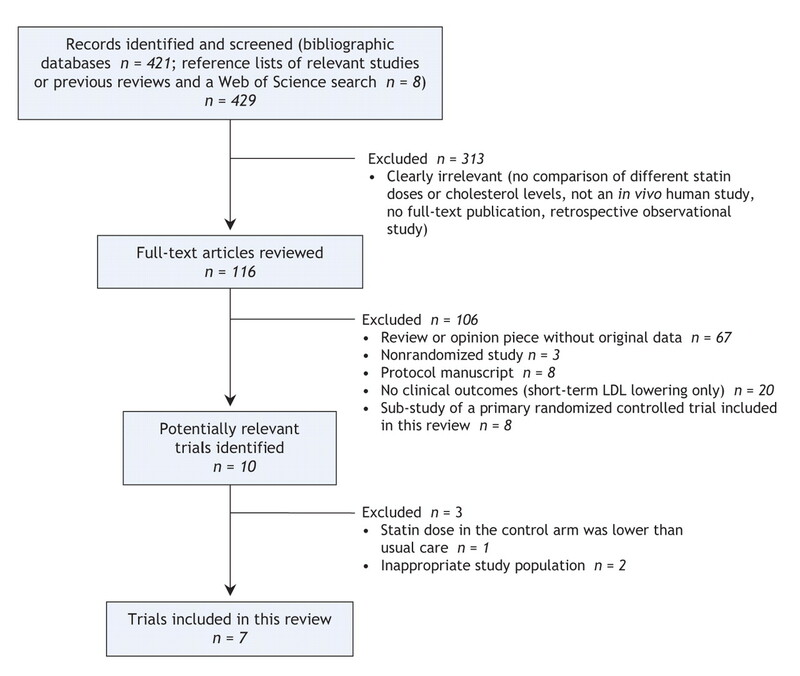 Efficacy and safety of cholesterol-lowering treatment: prospective meta-analysis of data from 90 056 participants in 14 randomized trials of statins. Lancet 2005;366:1267-78. Robinson JG, Smith B, Maheshwari N, et al. Pleiotropic effects of statins: benefit beyond cholesterol reduction? A meta-regression analysis. J Am Coll Cardiol 2005;46:1855-62. McPherson R, Frohlich J, Fodor G, et al. Canadian Cardiovascular Society position statement: recommendations for the diagnosis and treatment of dyslipidemia and prevention of cardiovascular disease. Can J Cardiol 2006;22:913-27. Grundy SM, Cleeman JI, Merz CN, et al. ; Coordinating Committee of the National Cholesterol Education Program. Implications of recent clinical trials for the National Cholesterol Education Program Adult Treatment Panel III Guidelines. Circulation 2004;110:227-39. De Backer G, Ambrosioni E, Borch-Johnsen K, et al. European guidelines on cardiovascular disease and prevention in clinical practice. Third joint task force of European and other societies on cardiovascular disease prevention in clinical practice. Eur Heart J 2003;24:1601-10. Hayward RA, Hofer TP, Vijan S. Narrative review: lack of evidence for recommended low-density lipoprotein treatment targets: a solvable problem. Ann Intern Med 2006;145:520-30. Kashani A, Phillips CO, Foody JM, et al. Risks associated with statin therapy. A systematic overview of randomized clinical trials. Circulation 2006;114:2788-97. Armitage J. The safety of statins in clinical practice. Lancet 2007;370:1781-90. Post Coronary Artery Bypass Graft Trial Investigators. The effect of aggressive lowering of low-density lipoprotein cholesterol levels and low-dose anticoagulation on obstructive changes in saphenous-vein coronary-artery bypass grafts. N Engl J Med 1997;336:153-62. Higgins JPT, Thompson SG, Deeks JJ, et al. Measuring inconsistency in meta-analyses. BMJ 2003;327:557-60. Cannon CP, Braunwald E, McCabe CH, et al. ; Pravastatin or Atorvastatin Evaluation and Infection Therapy–Thrombolysis in Myocardial Infarction 22 Investigators. Intensive versus moderate lipid lowering with statins after acute coronary syndromes. N Engl J Med 2004;350:1495-504.
de Lemos JA, Blazing MA, Wiviott SD, et al; A to Z Investigators. Early intensive vs a delayed conservative simvastatin strategy in patients with acute coronary syndromes: phase Z of the A to Z trial. JAMA 2004;292:1307-16. LaRosa JC, Grundy SM, Waters DD, et al. ; Treating to New Targets (TNT) Investigators. Intensive lipid lowering with atorvastatin in patients with stable coronary disease. N Engl J Med 2005;352:1425-35. Pedersen TR, Faergeman O, Kastelein JJ, et al. ; Incremental Decrease in End Points Through Aggressive Lipid Lowering (IDEAL) Study Group. High-dose atorvastatin vs usual-dose simvastatin for secondary prevention after myocardial infarction: the IDEAL study: a randomized controlled trial. JAMA 2005;294:2437-45. Nissen SE, Tuzcu EM, Schoenhagen P, et al. ; REVERSAL Investigators. Effect of intensive compared with moderate lipid-lowering therapy on progression of coronary atherosclerosis: a randomized control trial. JAMA 2004;291:1071-80. Stone PH, Lloyd-Jones DM, Kinlay S, et al. ; Vascular Basis Study Group. Effect of intensive lipid lowering, with or without antioxidant vitamins, compared with moderate lipid lowering on myocardial ischemia in patients with stable coronary artery disease: the Vascular Basis for the treatment of myocardial ischemia study. Circulation 2005;111:1747-55. Deedwania P, Stone PH, Merz NB, et al. Effects of intensive versus moderate lipid-lowering therapy on myocardial ischemia in older patients with coronary heart disease. Results of the Study Assessing Goals in the Elderly (SAGE). Circulation 2007;115:700-7. Smilde TJ, van Willsen S, Wollersheim H, et al. Effect of aggressive versus conventional lipid lowering on atherosclerosis progression in familial hypercholesterolaemia (ASAP): a prospective, randomized, double-blind trial. Lancet 2001;357:577-81. Taylor AJ, Kent SM, Flaherty PJ, et al. ARBITER: Arterial biology for the investigation of the treatment effects of reducing cholesterol: a randomized trial comparing the effects of atorvastatin and pravastatin on carotid intima medial thickness. Circulation 2002;106:2055-60. Cannon CP, Steinberg BA, Murphy SA, et al. 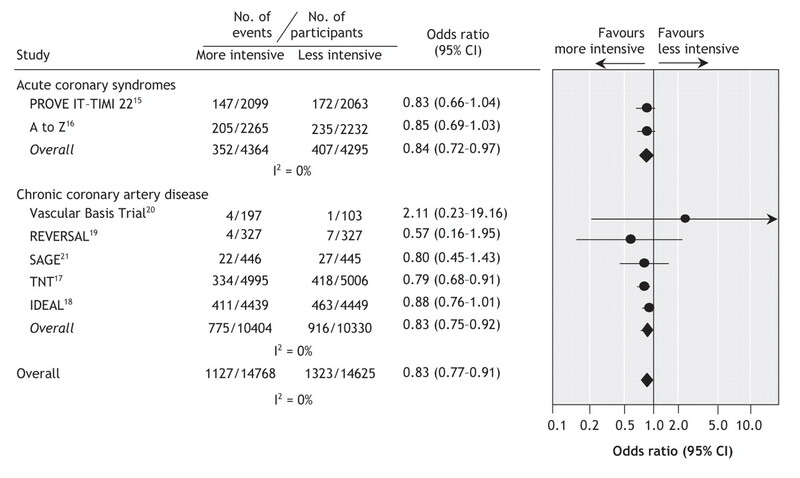 Meta-analysis of cardiovascular outcomes trials comparing intensive versus moderate statin therapy. J Am Coll Cardiol 2006;48: 438-45. Chan PS, Nallamothu BK, Gurm HS, et al. Incremental benefit and cost-effectiveness of high-dose statin therapy in high-risk patients with coronary artery disease. Circulation 2007;115:2398-409. Graham DJ, Staffa JA, Shatin D, et al. Incidence of hospitalized rhabdomyolysis in patients treated with lipid-lowering drugs. JAMA 2004;292:2585-90. Brown BG, Zhao XQ, Chait A, et al. Simvastatin and niacin, antioxidant vitamins, or their combination for the prevention of coronary disease. N Engl J Med 2001; 345: 1583-92. Stein E, Stender S, Mata P, et al. Achieving lipoprotein goals in patients at high risk with severe hypercholesterolemia: efficacy and safety of ezetimibe coadministered with atorvastatin. Am Heart J 2004;148:447-55. Bissonnette S, Habib R, Sampalis F, et al. Efficacy and tolerability of ezetimibe 10 mg/day coadministered with statins in patients with primary hypercholesterolemeia who do not achieve target LDL-C while on statin monotherapy: A Canadian, multicentre, prospective study — the Ezetrol Add-On Study. Can J Cardiol 2006;22:1035-44. Deedwania P, Barter P, Carmena R, et al. Reduction of low-density lipoprotein cholesterol in patients with coronary heart disease and metabolic syndrome: analysis of the Treating to New Targets Study. Lancet 2006;368:919-28. McAlister FA. Applying evidence to patient care: from black and white to shades of grey. Ann Intern Med 2003;138:938-9. Grundy SM. The issue of statin safety. Where do we stand? Circulation 2005;111:3016-9. Pablos Mendez A, Barr RG, Shea S. Run-in periods in randomized trials: implications for the application of results in clinical practice. JAMA 1998;279:222-5. Statins in Acute Coronary Syndromes: Do the Guideline Recommendations Match the Evidence?